Our Organic sleep balm contains an array of natural ingredients that are proven to aid relaxation , ..
Our Cannabis Sativa sleep Balm contains hemp, Frankincense, Petitgrain and Rose Geranium. Our Cannab.. 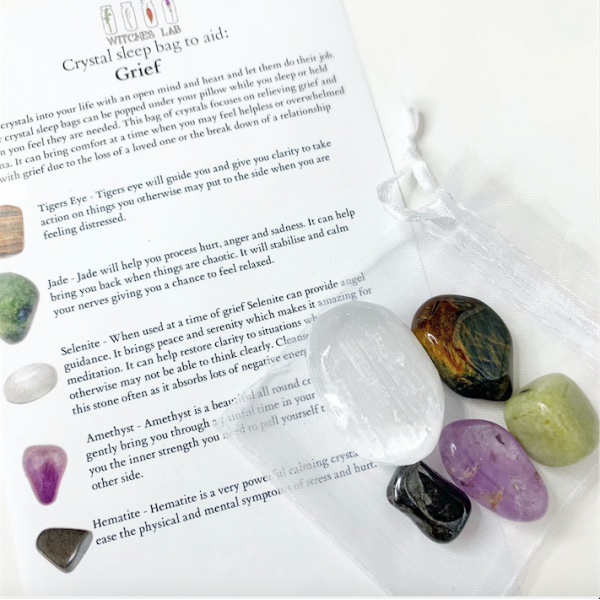 I have put together a selection of my favourite and most essential crystals that can be put under yo.. Invite crystals into your life with an open mind and heart and let them do their job. I have been facinated and continually amazed by crystals for a number of years which is why I have put together some sleep bags. These can be popped under your pillow while you sleep or held and taken around with you in your bag when you feel they are needed. Each crystal has a huge list of benefits which I will go into further detail about in my blog. The list of benefits I have included below fit in with how they will specifically help you and guide you if you have recently experienced something traumatic, Loss of a love one or the end of a relationship. Selenite - When used at a time of grief Selenite can provide angel guidance. It brings peace and serenity which makes it amazing for meditation. It can help restore clarity to situations when you otherwise may not be able to think clearly. Cleanse and recharge this stone often as it absorbs lots of negative energy. Jade - Jade will help you process hurt, anger and sadness. It can help bring you back when things are chaotic. It will stabilise and calm your nerves giving you a chance to feel relaxed. Amethyst - Amethyst is a beautiful all round crystal and it will gently bring you through a painful time in your life. It will give you the inner strength you need to pull yourself through to the other side. Hematite - Hematite is a very powerful calming crystal that will ease the physical and mental symptoms of stress and hurt. Tigers Eye - Tigers eye will guide you and give you clarity to take action on things you otherwise may put to the side when you are feeling distressed. Cleansing and charging your crystals: I have cleansed and charged these crystals myself however they are sensitive and can pick up energies along their journey to you so I recommend when your crystals arrive you can soak them in salt water for 1-24 hours (please do not submerge Hematite or Selenite these need to be dry cleansed as they are porous) whenever you feel like your crystals could have picked up or absorbed any negative energies repeat this step again. You can also supercharge your crystals under a full moon by placing them in the moonlight just after sunset ( I will touch more on this in my blog but please feel free to research this online you will find endless information if you are a new crystal owner) Your crystals are yours they will work with your energy and you will feel connected and loving towards your crystals. Crystals should of course not be use in replace of medical help or counselling if you feel you are suffering from anxiety or depression we encourage you seek help with your GP. Crystals bring calmness and guidance to many peoples lives but be responsible with your mental health and speak to someone if you are suffering. Invite crystals into your life with an open mind and heart and let them do their job. I have been fa..